Disney Cruise Line introduced the first of its twin Dream-class ships, the 130,000-gross-ton, 4,000-passenger Disney Dream, in 2011. This was the first new vessel for the company since the smaller Disney Wonder in 1999. In 2012, the Disney Dream was followed by the structurally and mechanically identical Disney Fantasy. While the ships share many of the same features, there are a number of differences between them that range from the subtle to the obvious. The Disney Dream, also known as Hull No. 687, was built by the acclaimed Meyer Werft shipyard in Papenburg, Germany. Disney Fantasy is Meyer Werft Hull No. 688. Meyer Werft is known for its exacting standards and high quality, having recently delivered Celebrity Cruises’ Solstice class, Royal Caribbean’s Radiance platform and Norwegian’s Star and Gem series of ships. Externally, the Disney Dream and Disney Fantasy can be distinguished by the Disney character “mascots” on their sterns. On the Disney Dream, it is Mickey Mouse. The character on the Disney Fantasy’s stern is Dumbo the elephant. Disney Dream and Disney Fantasy, while state of the art and equipped with all the latest modern facilities, take their architectural inspiration from the great Atlantic liners of the past, namely French Line’s SS Normandie of 1935. Both ships boast an AquaDuck water coaster that hurtles riders through a 765-foot-long acrylic tube that winds through both funnels and over the midships lido. Here is the AquaDuck on the Disney Dream. A nearly identical AquaDuck water coaster can be found on the Disney Fantasy. On both ships, the ride extends at one point on a loop 150 feet above the ocean. On the Disney Dream, the Satellite Sun Deck sunning and observation platform overlooks the bow from Deck 13. On the Disney Fantasy, the same space has been enhanced with shaded awnings and a water fountain at the base of the central satellite dome. Here is a view facing aft from Disney Dream’s starboard Deck 13, showing the open decks at the base of the ship’s twin funnels. A similar view from the Disney Fantasy shows the addition of a wading pool at the base of the forward funnel and awnings on either side of the ship on Deck 12. Facing forward from aft Deck 13, there is an impressive view of the Disney Dream’s funnels and the AquaDuck. The same view on Disney Fantasy reveals only a tiny variation or two in the AquaDuck tubing. This is a nighttime view of the Disney Dream’s adults-only Quiet Cove pool area on forward Deck 11. On the Disney Fantasy, the Quiet Cove pool area is identical to that of the Dream. The Disney Dream has the al fresco Waves Bar on aft Deck 12. On the Disney Fantasy, Waves was replaced by the 1,800-square-foot AquaLab water park. This aft-facing view of Disney Dream’s midships Deck 11 pool area shows the Donald’s family pool in the foreground and the kids-only Mickey’s wading pool in the background. On Disney Fantasy, no notable changes have been made to the same area. For both ships’ festive deck parties, there is a retractable dance floor platform that slides over each pool. Both ships (Disney Fantasy shown) have wonderful wrap-around promenades on Deck 4. On the Disney Dream, there are seating alcoves in the promenade that are adjacent to the adults-only District on aft Deck 4. On most ships, the open fo’c’sle is usually a mooring or crew deck. The Disney Dream was the first to incorporate this space on Deck 5 level into a terrace shared by the Vibe Teen Center. Here is the same view on the Fantasy, which is identical in all key aspects. On both ships, lights shine from the hull to illuminate the sea. This view was taken from Disney Dream’s Deck 13. And this view of the illuminated sea was taken the Disney Fantasy’s Deck 4 promenade. Passengers on both ships embark on the lowest (Deck 3) level of the three-deck Atrium Lobby. On the Disney Dream, a bronze Donald Duck sculpture is located at the foot of the grand staircase. On the Disney Fantasy, the bronze sculpture at the foot of the grand staircase is Minnie Mouse. The Art Deco-influenced Disney Dream has an ornate peacock chandelier as the main focal point of the Atrium Lobby. The Art Nouveau-influenced Disney Fantasy also has an elaborate peacock chandelier hovering over its Atrium Lobby. Here is a view of the Disney Dream’s chandelier from the balcony on Deck 5. And here is the same view on Disney Fantasy. In addition to the different chandeliers, there are variations in decking, carpeting and bulkhead (wall) treatments. Both ships have extensive Senses Spas that overlook the sea from a Deck 11 perspective. The waiting room in Disney Dream’s Spa is shown here, facing aft. The identical space on Disney Fantasy is shown here, facing forward. Even the artwork is the same in this particular venue on both ships. This is the entrance to the Rainforest, the Disney Dream’s thermal suite. In addition to a Hamam (Turkish bath), several steam rooms (Laconium, Caldarium, dry and wet saunas), the Rainforest (shown on Disney Fantasy) features a wet area with showers that have specialized water and misting jets. Identical gyms on both ships are relatively small but well-equipped. This is the cardio area on the Disney Dream. Both ships also have a Chill Spa, dedicated exclusively to teens. This is a treatment room on the Disney Fantasy. Here is a close-up of a butterfly mosaic in the Disney Dream’s Chill Spa. This is the relaxation room onboard the Disney Dream. On aft Deck 12, the Meridian Bar serves as an anteroom for the two adults-only extra-tariff restaurants, Palo and Remy. This is a port/forward-facing view of the Meridian Bar on Disney Dream. The Meridian Bar, shown facing aft on the Disney Fantasy, is identical to that of the Disney Dream. The room has open-air terraces on either side. Palo, shown here on the Disney Dream, is an extra-tariff Italian restaurant ($20 per person) that seats 176 on the starboard side of aft Deck 12. On the Disney Fantasy, there is a slight variation in soft fittings (namely the upholstery on the booths and chairs) versus its counterpart on the Disney Dream. Remy is the extra-tariff ($75 per person), 96-seat French Restaurant inspired by the Disney-Pixar film “Ratatouile.” Located on the port side of aft Deck 12, it is shown here facing aft on the Disney Dream. On the Disney Fantasy, Remy is almost identical to its namesake on the Disney Dream, aside from slightly different carpeting. Cabanas is a casual buffet-style dining venue on aft Deck 11. This is an aft-facing view on the starboard side of Cabanas aboard the Disney Dream. Cabanas on Disney Fantasy is identical to that on the Disney Dream, including the same wave-patterned carpeting, rattan furnishing and even the kite-shaped ceiling lights. The undersea-themed mosaics in Cabanas are among the most beautiful works of art on board both ships. This mosaic is onboard the Disney Dream. This is the nearly identical Cabanas mosaic onboard the Disney Fantasy. The Vibes Teen Center is located on forward Deck 5 and accessed via a passageway with pulsating fiber-optic lighting. This is the entrance onboard the Disney Dream. This is the entrance to Vibes onboard the Disney Fantasy. On the port side of Vibes, there is a soda bar. This is the one aboard Disney Dream. Aside from the absence of conical tables, the soda bar in Disney Fantasy’s Vibes is identical to that on the Disney Dream. The central portion of Vibes, shown on Disney Dream, facing starboard, is a semi-circular lounge area with a dance floor and large video screen. The same space, shown facing port, on Disney Fantasy, is identical to that on the Disney Dream. Edge is a tween club located on the Deck 13 level of the forward funnel. 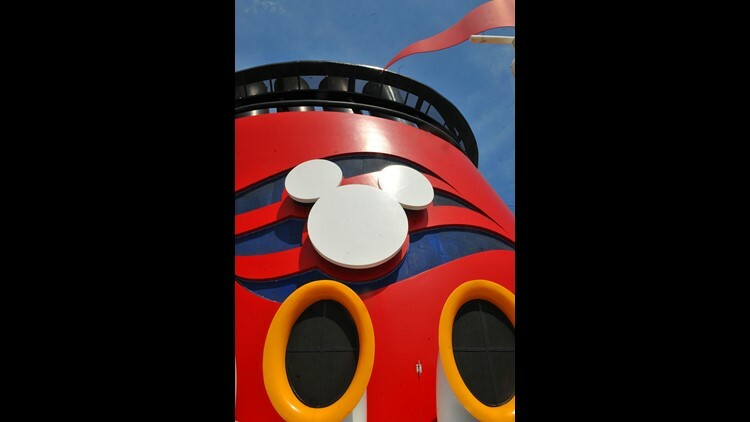 This is a forward-facing view of Edge on the Disney Dream. Although structurally identical to the facility on the Dream, Edge onboard Disney Fantasy has different furnishings. Part of the kids-only complex on midships Deck 5, the Oceaneer Club is for 3- to-10-year-olds. This is the facility on Disney Dream, the center portion of which features an interactive Magic PlayFloor where guests’ movements control the action. And here is the identical Oceaneer Club aboard the Disney Fantasy. The adjacent Oceaneer Lab also has a Magic PlayFloor as well as a number of computer stations and a navigation simulator. This is the same space on the Disney Fantasy. The largest public venue is the 1,340-seat, triple-level Walt Disney Theater. This is where the Disney Dream’s extravagant productions are staged. The Walt Disney Theater on the Disney Fantasy is identical to that on the Disney Dream. The Buena Vista Theater is a 399-seat cinema and lecture hall. This is the Disney Dream’s, facing starboard. Here is a port-facing view of the identical Buena Vista Theater onboard the Disney Fantasy. The Disney Fantasy’s Bon Voyage Bar is located on the port side of Deck 3, adjacent to the Atrium Lobby. Unlike its Art Deco counterpart on the Disney Dream, the Bon Voyage Bar on the Disney Fantasy has an Art Nouveau flourish. This mosaic panel in the Disney Dream’s Bon Voyage Bar depicts Prince Charming. This mosaic panel in the Disney Fantasy’s Bon Voyage Bar is a portrait of the glass carriage in Cinderella. All four Disney ships have their own “adults-only” areas. On the Dream, it is located on aft Deck Four and called The District, featuring a series of chic lounges and bars with mid-century modern decor. This is the District Lounge near the main entrance. On the Disney Fantasy, the adults-only sector is called Europa and features the La Piazza bar area at its entrance. Decor in this part of the ship is Art Nouveau-influenced with a European flourish. A special “Pink” vintage of Taittinger was created for Disney Dream’s Pink champagne bar. On the Disney Fantasy, instead of Pink, there is Ooh La La, a Parisian boudoir-inspired champagne bar. Named for its Meyer Werft shipyard hull number, 687 is Disney Dream’s clubby, Scandinavian modern-influenced watering hole and Sports Bar. The 687 pub on Disney Dram received a makeover in dry dock that included the lengthening of its bar and a change to its layout. The corresponding space on the Disney Fantasy is O’Gill’s pub, taking its name from the Disney feature film “Darby O’Gill and the Little People." The intimate Skyline Bar on the Disney Dream features dark wood veneers and a high-definition fiber-optic backdrop of a famed cityscape that changes nightly. On the Disney Fantasy, the Skyline Bar is laid out the same as that on the Disney Dream but its paneling is painted gray and it has its own unique soft fittings. On the Disney Dream, the dance club is called Metamorphosis. It features fiber-optic butterfly wings in its ceiling that change color. The vividly patterned The Tube is the fiber-optic-festooned nightclub on Disney Fantasy that resembles a London Tube station. All Disney ships feature the line’s innovative rotational dining where guests and their waiters move to the same table in a different restaurant each night. Shown on the Disney Dream, the Royal Palace is inspired by Disney Princesses: Cinderella, Snow White, Aurora and Belle. The Royal Court Restaurant on the Disney Fantasy is just as ornate as that on the Disney Dream but features different decor. Food in the Royal Court is inspired by Old World French cuisine, including lobster, jumbo shrimp and beef tenderloin. The Animator’s Palate first appeared on Disney’s classic Magic and Wonder of 1998 and 1999, respectively. On the Disney Dream, the concept of cartoon stills coming to life and the restaurant changing lighting and color is much the same. The Animator’s Palate on the Disney Fantasy looks almost identical to that on the Disney Dream but it has a few extra new twists. On high-definition screens situated throughout the restaurant, Disney characters interact with diners in the Animator’s Palate onboard the Disney Dream. On one “Animation Magic” night per cruise, Disney Fantasy guests can draw up their own characters on placemat templates which are then incorporated into videos shown on the high-definition screens in the Animator’s Palate. Inspired by the gardens of Versailles, the Enchanted Garden Restaurant on the Disney Dream evolves through the day via fiber-optic lighting and other effects such as fixtures that “bloom” during the course of dinner. Disney Fantasy’s Enchanted Garden Restaurant is much the same as its counterpart on the Dream, although in lieu of floral banners, it features hanging pots of flowers. Among the most lavish accommodations afloat are the 1,781-square-foot Walt and Roy Disney Suites on forward Deck 11. This is a forward-facing view of the living room of the Roy Disney Suite on the Disney Dream. This is an aft-facing view of the living room of the Roy Disney Suite on the Disney Fantasy. Note the chandelier and different soft fittings. These Category R suites also have huge balconies with private Jacuzzis, a separate bedroom and master bath, a dedicated bar, walk-in closet and guest WC. The 622-square-foot Suites on the Dream-class ships feature separate bedrooms and sitting areas as well as large balconies, some of which are enclosed in domed glass. This is an inboard-facing view of a Category T suite on the Disney Dream. Aside from the artwork and the curtains, the suites on the Disney Fantasy are almost identical to those on the Dream. The 306-square-foot Family Oceanview Staterooms with Balcony have a pastel color scheme in concierge class versus the vivid reds and blues of regular staterooms in this category. This is one on the Disney Fantasy. Oceanview with Verandah Staterooms measure 246 square feet and are identical in look (with either red or blue bedspreads). This a “red spread” on the Disney Dream. And this is a “blue spread” Oceanview with Verandah on the Disney Fantasy. In lieu of standard portholes, 241-square-foot Deluxe Family Oceanview Staterooms on the Dream-class ships feature huge circular windows. This is stateroom 6672 on the Disney Fantasy. Interior Cabins on both ships range from 169 to 204 square feet and have innovative “virtual portholes” which feature a live, projected view of life outside the ship. To spice things up further, Disney characters will suddenly appear and work their way across the screen. All four Disney ships have cabins with family-style double bathrooms. One features a sink and bath/shower. And the second features a WC and sink. On Thursday, Disney Cruise Line announced new cruises setting sail during early 2020. In early 2020, Disney Cruise Line will establish a new home port in New Orleans. The cruise line also announced a highly anticipated return to the Hawaiian Islands; cruises out of Puerto Rico; and popular itineraries to tropical destinations from Florida and California. Disney Cruise Line said its first-ever sailings out of New Orleans, starting in February 2020, will be on the Disney Wonder. The cruise line also said it would continue to base its two largest ships — the Dream and the Fantasy — at Port Canaveral, Florida. • The Dream will sail three- and four-night Bahamian cruises to Nassau and Castaway Cay. Disney's private island. The cruises will depart on Fridays and Mondays. • The Fantasy will sail seven-night Eastern and Western Caribbean itineraries, plus two special sailings of six and eight nights each. The seven-night cruises will depart on Saturdays. The sailing schedule announced Thursday extends from January through May 2020. Port Canaveral Chief Executive Officer John Murray noted that Disney has been a long-term cruise partner of the port. He said the port officials are "excited to be continuing to be working with them well into the future." Disney's fourth ship, the Disney Magic, will be based at the Port of Miami in early 2020, sailing three-, four- and five-night Bahamian cruises and five-night Western Caribbean cruises. At 83,308 tons, the Disney Wonder is relatively modest in size compared to some of the latest mega-ships. It holds just 1,754 passengers at double occupancy. With all berths filled, it can accommodate about 2,700. The hub of Disney Wonder's top deck is its family-friendly Goofy's Family Pool area. The area is flanked by two whirlpools and a stage and dance floor. The Goofy Family Pool area also is home to a giant, 24-foot-wide LED screen that plays current and classic Disney films throughout the day. Teak tables and chairs can be found overlooking the water on Deck 9 near the main Goofy Family Pool. Located just aft of Disney Wonder's two funnels on Deck 9 is a second pool area dedicated to children that was completely reinvented during the ship's makeover. Now called the AquaLab, it's home to a freshwater pool, water slide and watery play area. One of the most notable new features on the top deck of the Disney Wonder is the AquaLab's spiraling water slide, Twist 'n' Spout. The Twist 'n' Spout water slide begins at the back of one of the Disney Wonder's two funnels. The Twist 'n' Spout water slide ends in a long yellow run on Deck 9. The AquaLab features squirting pop jets and other watery features that were added during the ship's makeover. Dory's Reef is a protected area of the AquaLab reserved for the smallest toddlers. One of the many kid-friendly touches on the Disney Wonder is the rack of children's life jackets available for use at the AquaLab pool area for no extra charge. Located near the back of the Disney Wonder is a third pool zone called Quiet Cove that is for adults only. Quiet Cove has a four-foot-deep main pool and two whirlpools. Quiet Cove is reserved for passengers who are at least 18 years old. The whirlpools in the Quiet Cove area are covered for protection from the sun. The Quiet Cove pool area has an elegant feel that comes in part from its rows of upscale lounge chairs with plush cushions. Located at Quiet Cove, Signals is an adults-only outside bar. Signals offers a range of beers on tap including Blue Moon. Just around the corner from the Quiet Cove pool is the Cove Cafe, a specialty coffee outlet. Cove Cafe serves up hand-made espresso drinks as well as alcoholic drinks. The bases of Disney Wonder's two crown-topped funnels are inspired by the triple stacks of the famed, 1930s-era SS Normandie. At the very front of Disney Wonder is the Wide World of Sports Deck, which features a basketball court. Open space at the top of the Disney Wonder on Deck 10 offers rooms for lounge chairs. Just off the AquaLab kiddie pool area is a small quick-serve food outlet called Daisy's De-Lites. It offers paninis, salads and fruits during the day. One of the most popular spots with children on Deck 9 is Eye Scream, which dispenses soft serve ice cream available at no extra charge. The hub of Disney Wonder's interior is the Lobby Atrium, which underwent a major transformation during the ship's 2016 makeover. The overhaul of the Lobby Atrium included the removal of one of its two sweeping staircases and the addition of a new chandelier. The Lobby Atrium still is home to the Disney Wonder's iconic statue of Ariel from the Disney movie The Little Mermaid. The new chandelier in the Lobby Atrium takes its inspiration from the flower that Ariel from Disney's 'The Little Mermaid' wears in her hair. Nods to the movie run through the Lobby Atrium space. A comfortable seating area is located at the base of the Lobby Atrium along a wall of giant porthole windows. A small seating area is located on Deck 4 overlooking the Lobby Atrium. Disney Wonder's largest public space, the 977-seat Walt Disney Theatre has unobscured sight lines and state-of-the-art sound and lighting. Just outside the Walt Disney Theatre is Preludes Bar, a semi-circular alcove where passengers gather before shows. Located on Deck 5, the 278-seat Buena Vista Theatre shows Disney animated and action movies throughout the day, many in 3D. Located on Deck 3 between two of the Disney Wonder's three main restaurants is the Promenade Lounge. Home to live entertainment, the Promenade Lounge has a small stage and dance floor. Open to families with children, the Promenade Lounge also features seating along large circular windows overlooking the sea. Located on Deck 4, Animator's Palate is one of three 'rotational' dining venues where passengers share the same table with the same wait staff each night in a different restaurant. Disney Wonder's Animator's Palate now is home to the same Animation Magic show found on other Disney ships. Animator's Palate received significant upgrades during the Disney Wonder's makeover although the basic look remains the same. Passengers draw figures on place mats at Animator's Palate that then appear on wall screens during the Animation Magic show. One of the biggest changes during the makeover of the Disney Wonder was the addition of Tiana's, a restaurant that takes its inspiration from the movie The Princess and the Frog. Tiana's has a New Orleans supper club vibe and features live music from a band playing jazz, blues and swing. Occupying the space that formerly housed the Parrot Caye restaurant, Tiana's now has a stage for live music. Designed to appeal as much to adults as to kids, Disney Wonder features an adult-only entertainment district called After Hours. Giant portholes with seating line a stretch of Deck 3 in the After Hours area. Filling up more than a third of Deck 3, the After Hours area includes a revamped nightspot called Azure. Taking its inspiration from the sea, Azure features wave-like wall and ceiling decor. The stylish bar at Azure. Also part of the adult-only area is the Cadillac Lounge, which received a significant overhaul during the Disney Wonder makeover. Home to live piano music nightly, the Cadillac Lounge offers Cadillac-themed furnishings. Little touches in the Cadillac Lounge include side tables shaped like tires. The bar in the Cadillac Lounge. After hours features a new English-style pub called The Crown and Fin. The Crown and Fin serves up a wide range of beers as well as other drinks. Located on Deck 4, the D Lounge is a nightclub and entertainment area that is open to the entire family. Revamped during the Disney Wonder makeover, the D Lounge features games and activities during the day. The D Lounge has a small stage and dance floor. Disney Wonder also has an extra-charge, adults-only Italian eatery called Palo. Located on Deck 10, Palo is open for brunch and dinner for a cost of $30 per person. Venetian ceramics lines the entryway to Palo. In addition to its three main restaurants, Disney Wonder has a casual buffet eatery called Cabanas on Deck 9 just outside the AquaLab kiddie pool area. Cabanas is open for breakfast, lunch and dinner. A signature of Disney ships is complimentary sodas available in the Cabanas eatery as well as at a station near the ship's pools. Art Nouveau flourishes on the Disney Wonder extend to its elevator banks. A Mickey hand signals the floor location for elevators on the Disney Wonder. Like other Disney ships, Disney Wonder has a lovely, teak-lined promenade that wraps all the way around the vessel. Disney Wonder's promenade features traditional teak lounge chairs topped with comfortable cushions. The Disney Wonder was built near Venice, Italy by Fincantieri, an Italian state-owned shipbuilding company that has built dozens of cruise ships in recent years. Cabins on the revamped Disney Wonder have been redesigned with new, nautical decor and more usable space, including elevator bed frames that provide space for storing empty luggage. In keeping with Disney Wonder's family focus, many of the cabins on the ship include large sofas that can convert into an extra bed. Balcony cabins on the Disney Wonder cabin feature a sitting area with a television. Balcony cabins on Disney Wonder have a desk area with a deck phone that can be used around the ship. Nightstands in cabins feature flexible electrical outlets that can accommodate both U.S.- and European-style plugs. Sketches for classic Disney films such as Pirates of the Caribbean are among the art in Disney Wonder cabins. In another family-friendly twist, most cabins on Disney Wonder have two bathrooms. In addition to a bathroom with a sink and toilet, there is a bathroom with a sink and tub/shower. The dual bathroom structure allows multiple members of larger families to get ready in the morning at the same time. Concierge cabins and suites on the Disney Wonder come with upgraded Elemis toiletries. A built-in hair dryer is one of the amenities found in cabin bathrooms. Disney Wonder cabins have large, built-in wardrobes. Built-in wardrobes in Disney Wonder cabins feature space for hanging clothes, a safe and life jackets. Disney Wonder cabins have miniature refrigerators that are not stocked. The makeover of the Disney Wonder included a major overhaul of the ship's Oceaneer Club for children. Among the additions: A new area called Marvel Super Hero Academy. The Marvel Super Hero Academy area will feature appearances by such Marvel characters as Black Widow. The Marvel Super Hero Academy area also features displays of iconic Marvel objects. Also new at the Oceaneer Club is a 'Frozen'-themed area called Wandering Oaken's Trading Post. An animated Oaken sometimes makes appearances in the window to the sauna at the back of the Wandering Oaken's Trading Post. Oceaneer Club also has a two-story area themed to the Disney-Pixar movie 'Toy Story' called Andy's Room. Andy's Room has a slinky-themed slide and other larger-than-life features. Another area of the Oceaneer Club is themed around Disney stories. It's a Small World Nursery on Deck 4 is open to children ages three months to three years. Located on Deck 9 near the main pool areas, Edge is a club exclusively for tweens. Also getting an upgrade during the overhaul of the Disney Wonder was the Senses Spa & Salon. The Senses spa offers 13 treatment rooms including three designed for couples. Couples treatment rooms on Disney Wonder include a sitting area with whirlpool that overlooks the ocean. The Senses spa has a full-service salon that includes a barber area for men. Professional studio sessions can be arranged for families and groups at Shutters, the Disney Wonder's portrait studio on Deck 4. Kiosks on Deck 4 display photos taken by ship photographers that can be purchased during a sailing. A pair of shops loaded with Disney merchandise can be found just outside the Walt Disney Theatre on Deck 4. Princess outfits are among the offerings at Mickey's Mainsail, one of the shops on Disney Wonder. Clothing, toys and other souvenirs also are available at the Disney Wonder shops. Gyro, hamburgers and brats to go are on offer on Disney Wonder's top deck at Boiler Bites. Pizza also is an option on the top deck of Disney Wonder at Pinocchio's Pizzeria. Located near the Goofy's Family Pool on Deck 9 is Sulley's Sips, which serves up smoothie's for an extra charge. Disney Wonder has self-serve lauderettes on several cabin decks. Detergent is available for $1 a box at the self-serve lauderettes on the Disney Wonder. Livestreaming from the Port Orleans Resort/French Quarter area of Walt Disney World near Orlando, host Mark Daniel revealed details of where the Disney ships are headed. • Disney will have three ships in Florida sailing to the Bahamas and the Caribbean from Port Canaveral and Miami, with ports of call that will include Disney's private getaway island, Castaway Key. • After a five-year hiatus, Daniel said the Disney Wonder will return to Hawaii with ports of call at Nawiliwili, Kahului, Hilo and Honolulu.